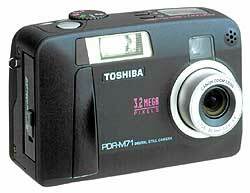 This latest Toshiba camera packs quite a few sophisticated features, not generally found on sub-$500 digicams. Some of these advanced features are a 5 mode flash system with red-eye reduction and its ability to accept third-part accessory lenses, such as wide angle, telephoto or fish-eye. The 2.8 times optical zoom of the PDR-71 has a 35-98 mm 35mm equivalent, which is useful for both still images and AVI movie recording. You can film up to three minutes of video at 160 x 120 at 15 frames per second or 60 seconds of AVI at 320 x 240, also at 15 fps. Sound is recorded using the camera's built-in microphone. White balance can also be adjusted. Videos are played back using a computer monitor, a television (NTSC/PAL) or the PDR-71's 1.5-inch color LCD. For the advanced shooter, the PDR-71 has both shutter and aperture priority automatic exposure, along with a REAL manual mode where you can set both shutter and aperture independently. The histogram feature is usually found only in very high Kodak digital cameras that start at over $5,000. Viewing a histogram display immediately after a picture is taken really helps you to determine if your image is really good or going to surprise you when you view it with Photoshop. The Toshiba PDR-71 captures images in three different sizes (2048x1536, 1024x768, 640x480) with three different compression percentages (fine, normal, basic). Looks like this camera will definitely heat up the competition in this $500 price range.